Share the Merry is here! November 12th through the 16th, you can buy one holiday handcrafted beverage and get one for free (of equal or lesser value). This is the perfect opportunity to try one of the five Starbucks holiday beverages. One thing to notice is that there isn’t a requirement that you buy a Grande size beverage. If you want to get two Venti drinks, by all means you can! You can get any two sizes you like, however the lesser value beverage is the one that is complimentary. The buy one, get one free event runs from November 12th through the 16th from 2:00 to 5:00 PM, though if you are a member of My Starbucks Rewards, you can enjoy an extra hour, until 6:00 PM. 'Tis a Giving Season at Starbucks: #ExtraShotOfGood happening at Starbucks. Yukon Blend, Komodo Dragon, & Kenya – the new look to Starbucks core coffees. Starbucks and Veterans: My Response. 1) No PSL or “fall drinks” for this, right? 2) Will the Eggnog Latte make it in time for *certain markets*, since the press release said it’s making it’s comeback on the week of the 17th in those markets? @MJM – I think that’s a very smart question. In fact, I’ve already emailed my contact at the Starbucks headquarters that very question because as I was writing this, I thought it was unclear. The way that little card is written is pretty ambiguous. The bottom fine print says “Buy any handcrafted beverage” and so by that, I would think it should include everything from Chai Lattes to Pumpkin Spice to anything handcrafted – even shaken iced teas. Just about everything a barista makes is a handcrafted drink – even Frappuccinos! Every other year, it’s been “buy a holiday beverage get a holiday beverage free”. I don’t know why it would change this year, but maybe it has. No word on when my store is actually getting eggnog. PSL and SCM (salted caramel mocha) count, as well as the non coffee versions of the holiday drinks (hot chocolates, steamed milk, etc.). I believe last year even Chegnogg was included :). The first year we did the bogo, PSL and SCM were not included, and it didn’t over well. Last year they were, and it was much better! If it is only holiday beverages, the SCM and PSL will NOT count for this promotion. They haven’t in past years as they are fall drinks, not holiday drinks. @Rebecca B – Thank you for the help! Actually I think it’s a remarkably ambiguous card! I’m a little surprised someone didn’t notice that before. If it’s really “any handcrafted beverage” you could have Frappuccino fun. On top of that, the 5 to 6 hour only says that you have to be a MSR member but doesn’t actually say you have to pay with a registered Starbucks card. That could cause confusion too! Anyone could say they’re part of MSR? Melody, it won’t ring up the second one free if they are not MSR members. Frappuccinos will count, but not the fall drinks (PSL/SCMF), unless the promo has changed to include fall beverages. @Kristen – What you are saying makes 100% sense to me – however, that card IS ambiguous. I’ll be blunt: It’s a terribly written card. If they had wanted it to include the 5 specific holiday beverages they should have said in fine print, “Offer limited to … ” and then list the 5 drinks. And if they wanted to have people pay with an MSR card, they should have used the verb “pay.” As a billion dollar corporation, I think they should be able to come up with a well-written card. Hopefully it won’t be an issue and 99% of customers will want one of the 5 holiday drinks, but I would say ambiguity should be resolved in favor of the customer. If I were Starbucks, I’d right now tell stores to pull those cards and toss them out. The DOB will probably be clear enough. But the cards are the source of ambiguity. Actually I read the flyer to only be eligible for holiday drinks only. Now I do agree the fine print doesn’t specifically say that. They should have included the word “holiday” when mentioning handcrafted beverage. 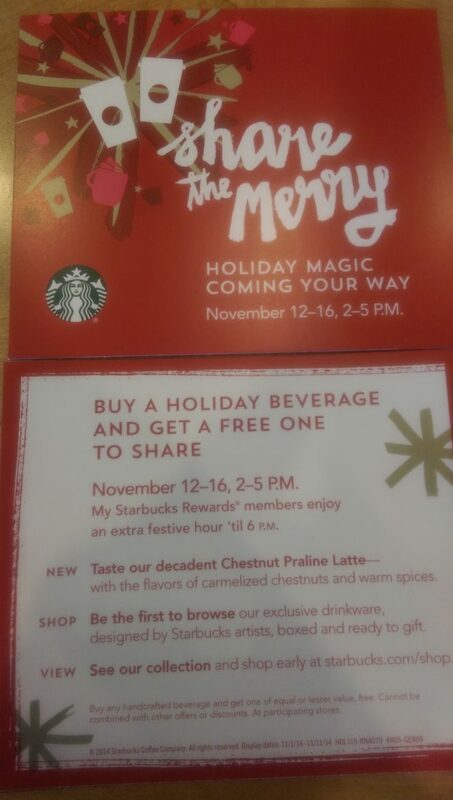 But since the main headline of the flyer specifically calls out holiday drinks, my interpretation would be fall drinks (PSL/SCM) would not be included. I guess the safe thing to do would be to ask the barista and they can check if the system allows it. Can I use my earned free drink reward as a MSR member on this, essentially getting both drinks free? I wish my free drink could be an Americano of the same size. That way my friends could have their sugar fix and I could enjoy an Americano. @MJM – Since the fine print does say, “Cannot be combined with other offers” I would say that “no” you can’t use your Lucky Dozen reward with this promotion. For buy “buy 5 get one” card, it’s buy any 5 holiday beverages, including Frappuccinos, get ANY (I believe grande) beverage free. My coworkers and I go at 2pm every day for our afternoon drink, they are going to be excited about this one! *Chai* Eggnog Latte would count, no? @MJM – I would think that a Chai Eggnog Latte would count indeedy! Would the skinny peppermint mocha count? Has everyone seen the phenomenal new holiday displays..? More gift cards than I can possibly imagine and such lovely festive colors. Cannot wait for ms melody to give us the full write up. Put me in the best of holiday spirits already.